The gourami (Trichogaster), also known as a labyrinth fish, is one of the most colorful ornamental fish and its distinctive behavioral habits make this a favorite fish for aquarists, according to Aquarium USA. Different species of gouramis, like the dwarf, croaking, chocolate, blue, moonlight, pearl and kissing gourami, can live in the same tank, so you can enjoy all the gourami’s unusual habits. Although gouramis touch their mouths together in what looks like a kiss, they actually are displaying aggressive behavior, sometimes known as mouth fighting. 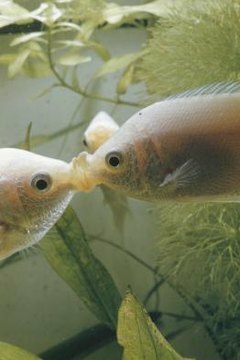 Kissing also can occur during mating or in aggressive situations, but gouramis usually are friendly, passive fish. This behavior is most noticeable in kissing gouramis, because of their large, protruding lips, but all gouramis use their mouths for “kissing” rocks, plants and gravel while searching for food. Gouramis touch everything in the aquarium, using their long, thin, sensitive pelvic fins as feelers to find food and potential mates, and maneuver their way through cloudy, muddy water. Although most fish tanks have clean water, gouramis continue this interesting habit, even touching all the other fish in the tank. If you have gouramis in your aquarium, avoid adding fish that nip at long, threadlike fins. All species of gouramis exhibit this habit, especially the dwarf gourami. You may notice that all gouramis reach out of the water for gulps of air, as if breathing. All types of gouramis gulp the air at the water’s surface, which passes through the mouth into an extra respiratory organ that carries oxygen through a labyrinth into the gourami’s bloodstream. This labyrinth system supplements the gills, allowing gouramis to live in oxygen deprived or polluted water. Gulping air is most noticeable in snakeskin and kissing gouramis. Kissing gouramis make sounds during social interaction by grinding their teeth together. The male croaking gourami chirps and croaks when putting on a show for females. Two males also make the croaking sounds when aggressively facing each other. Many new fish hobbyists are surprised when they walk up to their aquarium and their gourami spits a jet of water in the air. Because of the gourami’s ability to gulp air, they can take in water and blow it out above the water line. Gouramis often spit water to knock insects out of the air, snatching them up for food. All gouramis also can jump above the water to grab insects.